Not the punchiest blog title, I know. I was tempted to title this “On finding Martyn’s exegesis rickety”, but I have a poncy alert with titles which begin with “On”. Either way, I had some time on my hands to do some research today – for the first time in far too long. 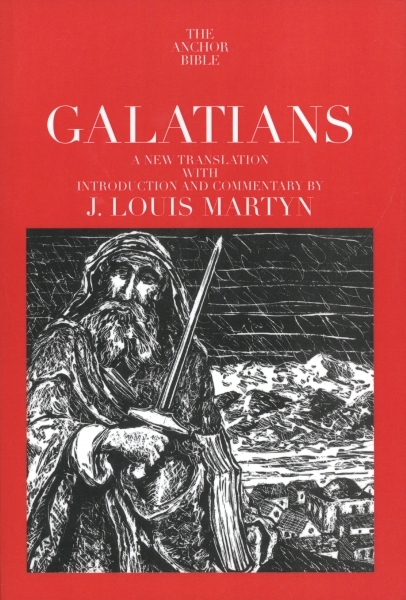 I decided to begin a reread of Lou Martyn’s Galatians commentary. When I first read it I simply didn't understand many of his major concerns and so felt profoundly “out of tune” with some of his exegetical endeavours. To be honest, I found some of his moves quite odd/wrong/illegitimate. It takes a while to get to know the academic community, but I remember being amazed when a friend warned me to take care in expressing critique of Martyn in the public domain, because some of his followers/admirers have a bit of a reputation for aggressively attacking those who take issue with their master! Now I have gotten to know said academic community better, this is no surprise to me at all! The NT scholarly world is filled with “interesting personalities”, and we are all, let's face it, tribal creatures (that sacred and profane just won’t seem to go away). And these days battle lines are being drawn between, on the one hand, so-called salvation-history approaches which focus on a covenantally conceived narrative, and on the other hand apocalyptic interpretations of Paul which emphasise instead the disjunction between creation and the new creation. Famously, one could make mention of the debate between Wright/Dunn and Martyn on this point concerning the significance of Christ as the seed of Abraham (Gal 3:16). I am not persuaded that the lines can be drawn quite like this, actually, and it is a huge mistake to pretend that “covenantal” and “apocalyptic” are mutually exclusive Pauline categories. (This is yet another reason you all need to read Douglas Campbell’s Deliverance, where he constructively moves the debate forward!) What matters is how they are seen to relate, and on this point there is a clear epistemological distinction between the two "camps". To put it in a nutshell, in my view both operate with different theological frameworks for understanding the nature of time. These days, I throw in my lot with those who claim that Christ is our contemporary (cf. Acts 1:16). And I believe Easter, in good Dr Who-shaped language, reminds us that Christ is Lord of time in his resurrection (see George Hunsinger’s essay “A Tale of Two Simultaneities”) and we risk profoundly putting things out of shape if we muddle things up on this. Having now begun a reread of Martyn’s commentary, I am certainly more “tuned in”, and as a result getting so much more out of it. Simply put, I now understand why people like this book so much. But I do not therefore baptise all of his exegetical moves as correct. Darn it, I still find some of his exegesis rickety, and my copy of his book is filled with question marks! You know, I've never been overly convinced by the need to separate salvation history from apocalyptic. I can't see why God shouldn't be able to do something apocalyptic within a salvation-historical framework. At least, that's what I tried openly to assume in my thesis on providence. Thanks, Terry, where do you argue this? Say more! I don't really argue it; it's more an assumption. But it's in my non-blockbuster, Providence Made Flesh (Paternoster, 2009). Lincoln should have a copy you can borrow, if he hasn't flogged it on Amazon!